Cane+Austin Facial Moisture Cream Review (2018): Is It Worth Buying? Cane+Austin Facial Moisture Cream Review: Ingredients, Side Effects, Customer Reviews And More. Cane+Austin Facial Moisture Cream, sold for a price of USD 80 for 1.6 oz (47.3 ml) jar, is a glycolic facial moisturizer that claims to gently exfoliate the skin and even out the skin tone. If you are on the lookout for a moisturizer that is most suitable for your skin type, you need to read this Cane+Austin Facial Moisture Cream review. About Cane+Austin Facial Moisture Cream – Does It Really Work? Cane+Austin is a skincare company that uses glycolic acid in all of their formulations. Since the founder has been using glycolic acids in all of his treatments for many years now, he aims to deliver the professional-grade results of the peel through products that his clients can use at home. Promote the natural collagen levels of the skin. Reduce the visibility of age spots. Gently exfoliate the skin surface. Bring back the vitality and luminosity. Don’t stop reading this review because there is more information about this product that you should know! What Are The Ingredients In Cane+Austin Facial Moisture Cream? 10% Glycolic Acid: This is a gentle exfoliant that can remove dead cells from the surface of the skin. It can address issues of blackheads, oiliness, acne, and dullness. It can also help in reducing the oil levels in the skin to prevent acne breakouts. Ubiquinone (Coenzyme Q10): This substance can penetrate the skin easily and can deliver antioxidant properties the skin and reduce the damage that is caused by free radicals. Camelia Sinensis (Green Tea) Leaf Extract: This reduces the oxidative stress that skin experiences. It can also diminish inflammation and bring back the moisture balance of the skin for a radiant complexion. Squalene: This improves both the elasticity and moisture balance of the skin. It can also regulate the production of oil that can aid in managing acne breakouts. For best results, apply a dime-sized amount of Cane+Austin Facial Moisture Cream to dry face after cleansing. Use this in the morning and at night to achieve optimum results. Avoid contact with eye area. You may feel a tingling sensation upon application which is considered normal. This product can moisturize and exfoliate the skin. The moisturizer is fragrance-free and noncomedogenic. The moisturizer contains pharmaceutical grade glycolic acid. It also has parabens which may be harmful to the skin. The active ingredient of the moisturizer may increase your skin’s sensitivity to the sun. Does Cane+Austin Facial Moisture Cream Have Any Side-effects? 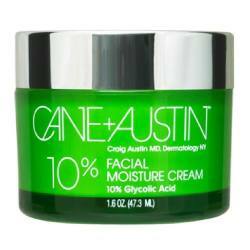 Cane+Austin Facial Moisture Cream offers moisturizing and exfoliating benefits to the skin. However, it contains a few unwanted chemicals that may irritate and harm the skin.